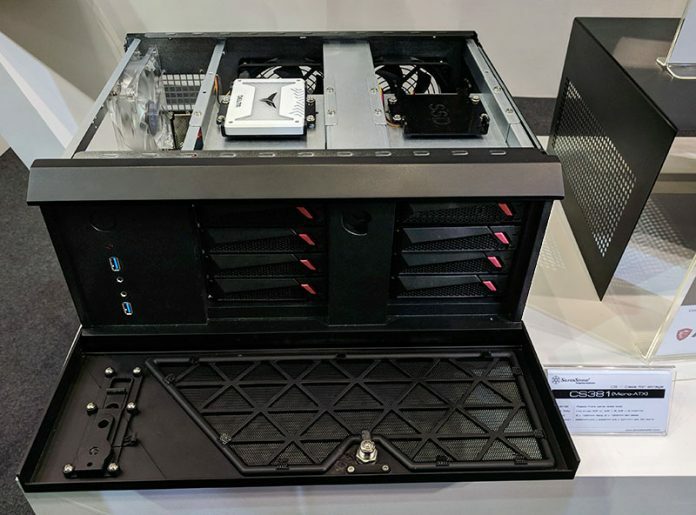 During Computex 2018 we saw the Silverstone CS381 up close and in a new iteration over the prototype shown off at CES a few months ago. The desktop NAS market is absolutely vibrant right now. We constantly see new offerings from companies like Synology and QNAP. While these commercial offerings are well thought out, they often lack higher-end features that power users seek. Silverstone is looking to change this with the CS381. In the DIY and appliance 3.5″ chassis market (e.g. the FreeNAS Mini), the Supermicro CSE-721TQ-250B is very popular. That desktop unit fits 4x 3.5″ drives and 2x 2.5″ internal drives plus a mITX motherboard into a relatively compact package. What that lacks is the ability to expand to more powerful setups, along with larger PCB form factors such as FlexATX and mATX which can better expose the features of new server platforms. The Silverstone CS381 is designed to slot above that chassis with the ability to scale to a more powerful system. During our brief Silverstone CS381 booth visit, we saw a number of exciting products. After going back through the photos, we wanted to highlight the CS381 specifically. It features 8x 3.5″ hot-swap drive bays. Given the price of hot-swap bays, it is usually beneficial to buy them already mounted in a chassis. Beyond these 3.5″ bays there are two 2.5″ top drive slots, intended for SSDs. One can mount two more on the side of the chassis near the PCIe expansion slots if an extra fan is not used. The case itself fits up to mATX motherboards and can handle 4x rear I/O slots. That is a huge upgrade over the mITX options out there. This is doubly so if one wants to create an entry deep learning server, such as we saw with Optimizing a Starter CUDA Machine Learning / AI / Deep Learning Build. 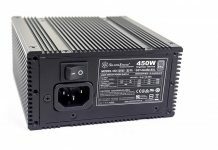 Beyond the larger form factor, Silverstone is using SFX power supplies. That has two advantages over mITX offerings to date. First, it allows for higher power output power supplies as Silverstone even has an 800W SFX PSU with an 80Plus Titanium rating. Second, it allows Silverstone to keep the chassis relatively small. 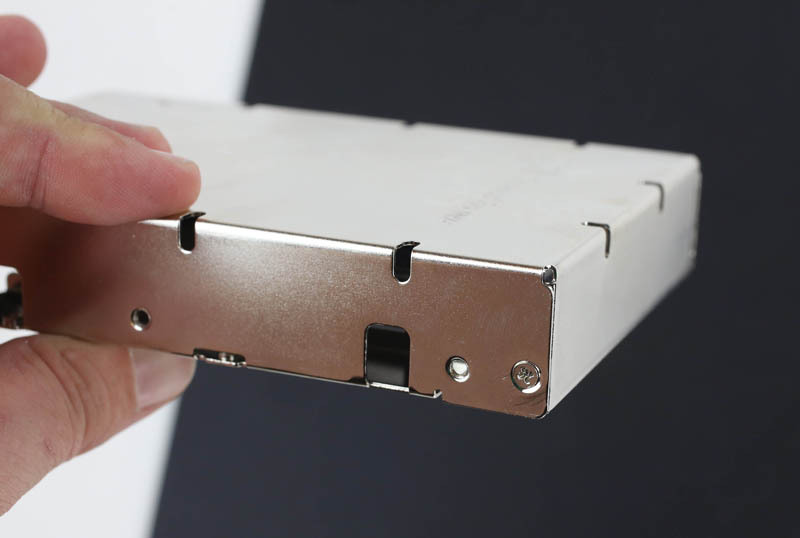 For higher wattage CPUs, the relatively low clearance between the hard drive cage and the motherboard may be a concern. For those STH’ers running Xeon D-1500, Xeon D-2100 and Atom C3000 series systems, we suspect someone will offer a solution, 3D printed or otherwise, to keep airflow to an acceptable level in this chassis. you mean FlexATX and microATX ? I wish there was a better view of the rear expansion slots… it looks like maybe there’s 3? That’d be good for something like the Supermicro Flex-ATX Xeon D boards, if you want to use a 2 slot video card. I picked up the Silverstone CS380 last year when I was building up my new NAS, and returned it almost immediately. The hotswap drivebays were a huge draw but the design of the drive cages along with how the fans were mounted meant you effectively had to get destructive and drill extra holes into the case for adequate drive cooling. 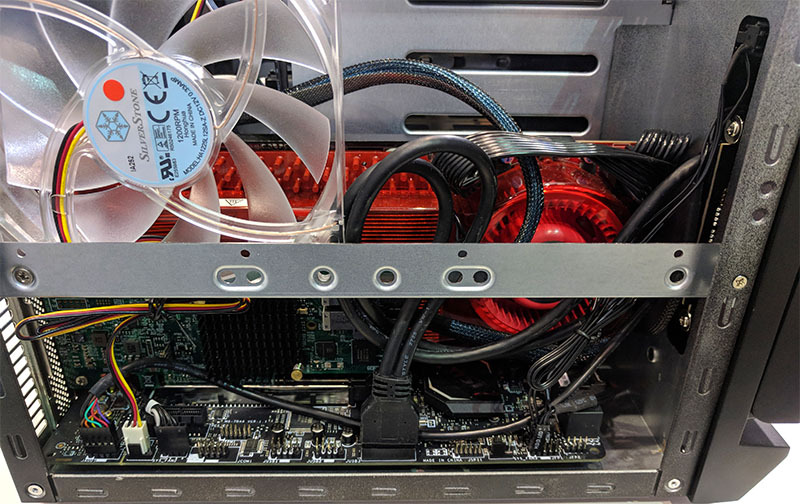 The rest of the case was decent, but the entire point was hot swap bays, and even after swapping the fans and adding some cardboard “ducting” the drives were idling at 48+C which drove me nuts. Sure, that’s “mostly” fine, but I dropped ~10C on all drives switching out to a Rosewill and Icydock bays. I’m a big fan of Silverstone iterating on the home server boxes, but I really need to see solid design on the drive cooling before giving them another shot. There are 4 rear expansion slots. I saw a video of a better view of this system. That red card is actually a 2 slot graphics card, and it looks like the smaller card is single slot with another slot empty. And that U-NAS chassis isn’t even that great.